The weather Gods are still unsure -whether to rain or not to rain? Meanwhile we ventured out on a Road trip to Bangalore ; more than almost a 2000km car drive to and from Nashik. We were a bit apprehensive about the road trip considering the ‘can’t sit in one place for a minute’ little one but decided to go anyway. Finger foods, drawing/coloring sets, car games, CDs later we were finally on the way to Bangalore. The back-seat of the car was turned into a mini bed for both the kids to play/eat/ sleep and enjoy. We preferred the Nashik –Mumbai highway and then the Mumbai-Pune expressway to the single lane and ‘boring’ Nasik-Pune highway upto Pune. 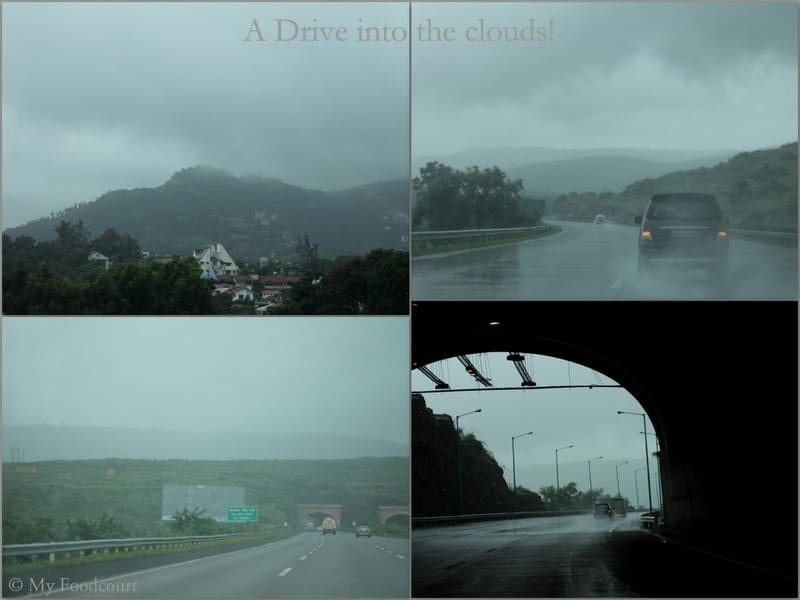 It was a scenic drive especially through the clouds in Lonavala just before Pune, and then the lovely windmills near Belgaum on the Bangalore highway. The road is fabulous except for the last 50-60 km as you near Bangalore. We halted at Belgaum for the night at ‘ Hotel Adarsh Palace’ . The hotel was good, clean and serves one of the best breakfast I have had on a road trip. The little one was impressed with their mini-button idlis. Except the 1-2 Kamat Upchar outlets and 1-2 coffe day outlets we didn’t see many Food stops post Belgaum. We had south Indian thali at the The Kamat Upchar on the Tumkur-Bangalore highway(~60 Km from Bangalore). Not the best of meals but enough to feed weary travelers. 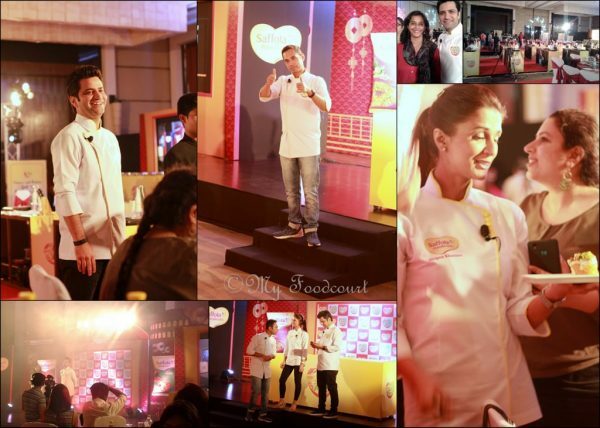 We were in Bangalore exactly for 1 and ½ days. I have been to Bangalore a couple of times earlier but haven’t seen the city and its surroundings in bits and pieces on each trip. 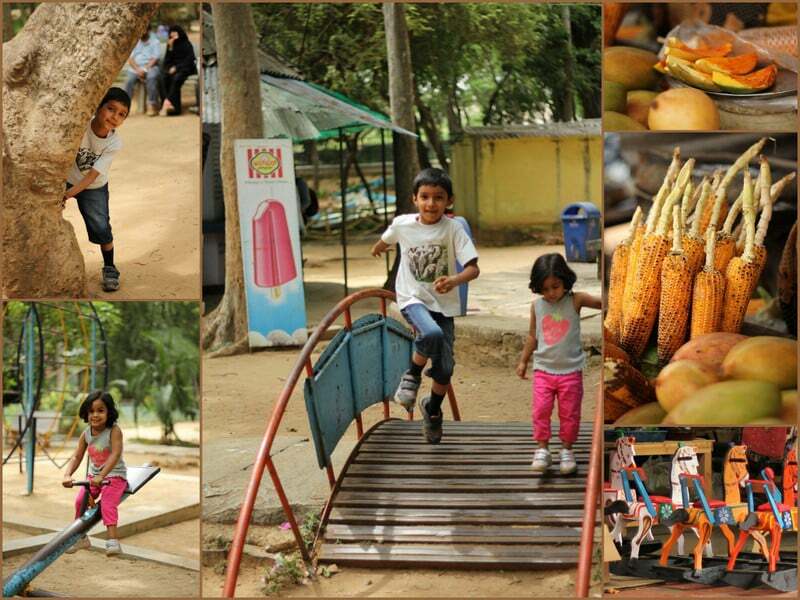 We could successfully squeeze in half a day trip to Bannerghatta Zoo and the Lalbaugh gardens. The lad was thrilled to see the animals at the zoo and also commented that the road trip was worth the effort The foodie that he is, he enjoyed the spicy-sour sweet succulent slices of ‘ Gini mooti (Totapuri) aam’ sold just outside the zoo. I got a chance to visit a Nature’s basket outlet in Indiranagar, Bangalore and I happily carried a few fresh herbs like Thyme and Rosemary, Avocados , instant Polenta and such items all the way to Nasik. Fresh Thyme and Rosemary are yet to make an appearance in the market here in Nashik, though my kitchen garden will grow them in a month or two- Fingers crossed. We stopped over at Kolhapur for the night on our way back and don’t have much to write about the hotel ‘Sony Palace’ just 2 minutes off the highway.The drive through Lonavala was even more scenic on the way back. Glad to report that the little one not only survived the car trip but is eager to go on another trip! The herbs survived the ride back home and were immediately used in as many dishes as I could. 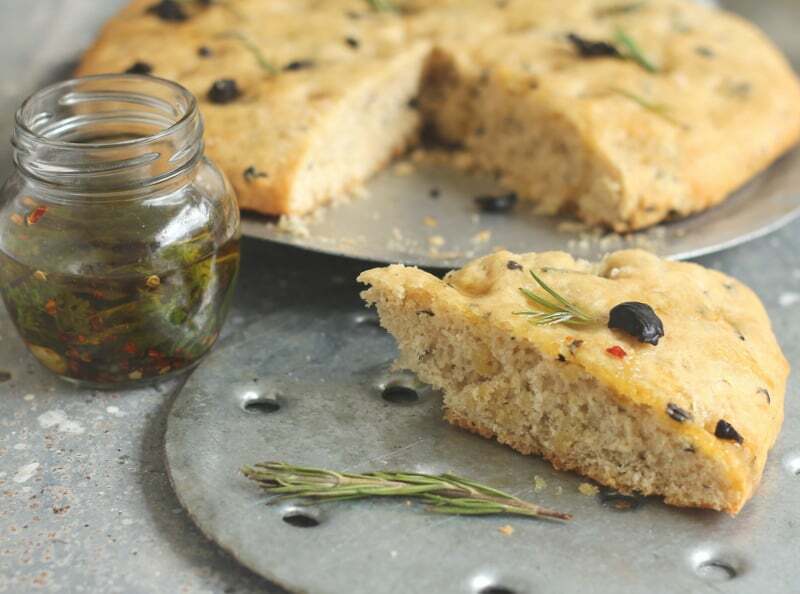 The Rosemary urged me to bake a lovely warm Rosemary and Olive Focaccia.Some of the thyme went into a Roasted tomato and Thyme soup. ; a perfect dinner combination for these ‘Rainy weather days’. 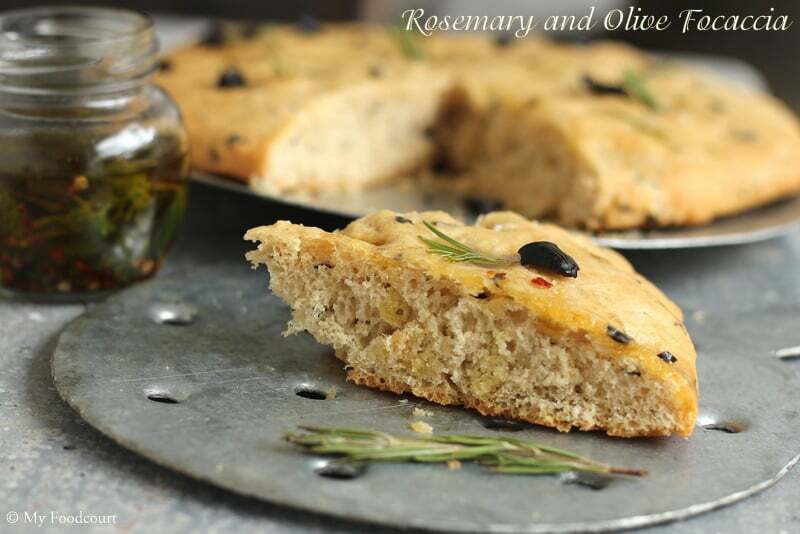 I have adapted the recipe for the Rosemary and Olive Focaccia from a book ‘Baking- simple cookery series’ from my collection of cookbooks. I have used some part whole wheat flour instead of total AP flour as recommened in the recipe with great results. The soup was made using whatever ingredients were available, Thyme being the star ingredient. Sift the Flours, salt and the sugar. Stir in the yeast and Rosemary. Carefully pour in the warm water and Olive oil/herb oil. I need about 10-20 ml more water so add the water gradually. Turn out onto a well floured surface and knead for 10 mins. (Yeast Therapy 🙂 until smooth and elastic. Pat the olives dry on a kitchen paper, and then gently knead into the dough. Turn out the dough and knead again for a minute or two. Divide into half and roll out each piece into a 10 inch (25.5 cm) circle. Transfer to oiled baking sheets and cover with oiled clingfilm/ foil and leave to rise for 30 minutes. Preheat the oven to 200oC. Using the finger tips make deep dimples all over the dough. Drizzle with the oil (I used herbed oil)and sprinkle with the sea salt. Bake in the preheated oven for 20-25 minutes or until risen and golden. My old oven took almost 10-12 minutes more. Cool on a wire rack and garnish with sprigs of Rosemary. Grind over or sprinkle black pepper just before serving. Preheat the oven to 200oC. Place the tomatoes on the baking sheet, cut side up along with the onions, garlic pods and Thyme twigs. 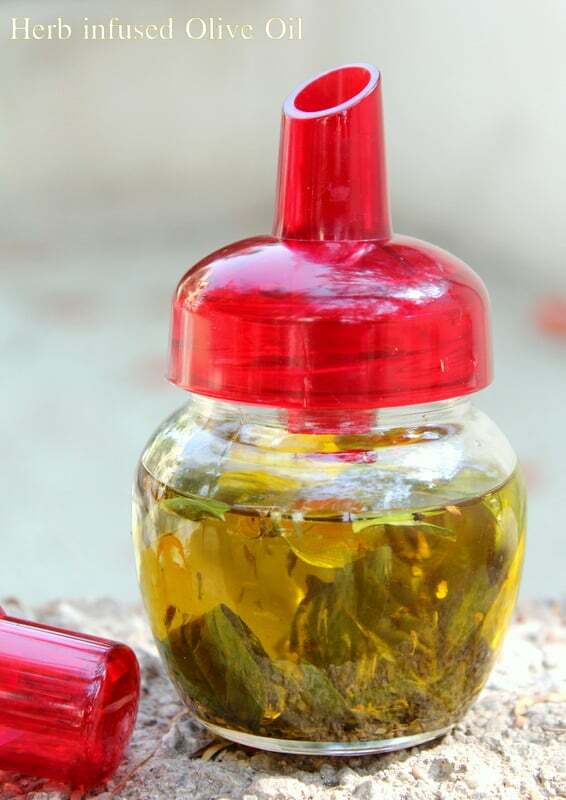 Drizzle the herb infused olive oil (or just olive oil) Sprinkle some coarse sea salt and pepper over the tomatoes. Roast the tomatoes for about 30 mins. Meanwhile Place water in a pan and boil the carrot cubes along with a sprig of Thyme till just soft ( 10 mins.) Drain and cool the carrot cubes but do not discard the water. Cool the Roasted tomatoes, onions and Garlic. Carefully remove the Thyme sprigs. Remove the skin from the tomatoes (or alternatively sieve the pulp later) Blend the roasted Tomatoes, sliced onion, garlic along with the cooked carrot. Transfer the pulp to a large pot. 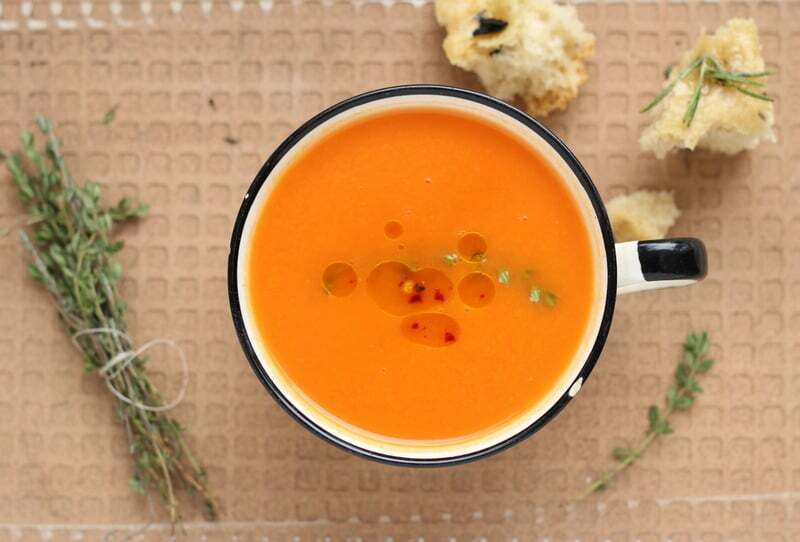 Adjust to a soupy consistency using the carrot stock (or vegetable stock) Add the brown sugar and adjust the seasoning. Bring to a boil and turn off the heat. 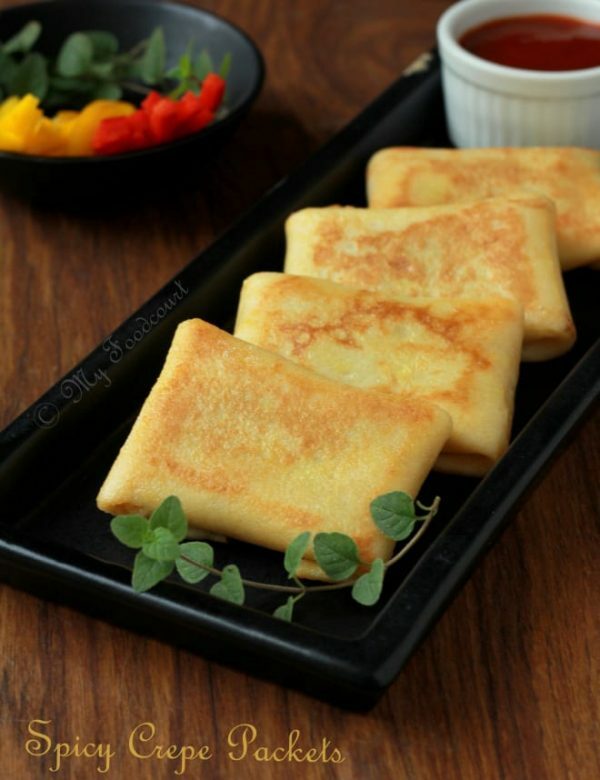 Serve hot garnished with the herb and chilli infused olive oil along with a warm bread. (You may alternatively garnish with Cheese of your choice) I served the Soup with the Rosemary & Olive Focaccia. What a wonderful road trip! I can’t believe you drove such long distances with two little ones. You went through two of my fav places- Kolhapur and Belgaum 🙂 have immediate family in both places. And yes, Adarsh Hotel has very good food. Never heard of Sony Hotel though. The bread and soup all looks very good and monsoon-friendly. 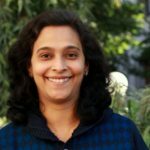 Do you live in Nashik? For some reason I thought you were in Bombay. I do visit Nashik to meet extended family on my trips to India. 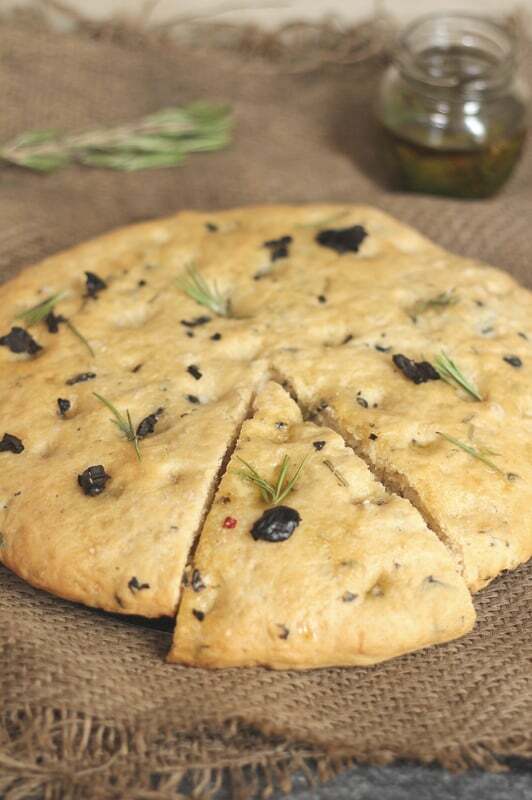 Love focaccia bread! This looks delicious! Thanks for sharing.